My name is Evelyn and in 1939 I was living in Hungerford Road with my father, stepmother and younger sister Florence. It was 11 a.m, Sunday 3rd September 1939. My sister and I were at morning service at our local church, St. John's the Evangelist. The service was about to begin when one of the wardens walked down the aisle and handed a note to the Reverend Rich. The curate looked down from the pulpit on the packed pews and announced that we were now at war with Germany. After a prayer we went home to be with our families. I remember wondering what it would all mean. I went to the City of Bath Girls' School from 1939-44. At school we practised wearing gas masks during lessons. We had drill in case of an air raid - my shelter was in the lower cloakroom. It never happened while I was at school though. One day while walking home from school my friend and I saw bombs leaving an aeroplane - we expected loud explosions but only heard and felt thuds. I thought they were time bombs. 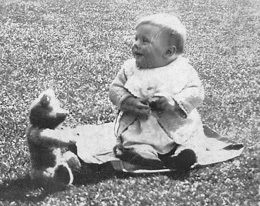 I was, on 25th April 1942, thirteen and three quarters years old and living in Hungerford Road with my father, stepmother and sister Florence, who was just twelve years old. It was Saturday, bath night; our clothes for washing were left in the bathroom and clean underwear and Sunday best were laid across chairs in the back bedroom. A Liberty Bodice was a fleecy knitted waist length vest with rubber buttons, re-enforcing cotton tapes and buttons to attach other garments to it. The sirens went; we thought it was yet another night sleeping downstairs while Bristol was bombed. From time to time a stray bomb dropped on Bath. Suddenly there were terrific bangs, breaking our windows and bringing down our ceilings. My sister and I got our clothes and tried to dress under the living room table. I remember fiddling with the buttons on my liberty bodice - I couldn't fasten them quickly enough. I was in the kitchen overlooking the garden, when from a small window I saw the chicken houses were on fire (no chickens, fortunately). My father, who was an Air Raid Warden, had left the house to attend to his duties. He came rushing into the house saying next door was on fire and we must grab what we could and get out. Florence and I rushed upstairs, but when we saw our ceilings were on fire we didn't wait to save anything. For a while we were out on the road watching our house burn. A young man dragged our piano and stool out. We heard planes swoop and machine gun fire. We took shelter in the cellar of a house opposite, but my stepmother panicked, saying we could all be burned alive, so we then made our way to the garages situated at the beginning of Audley Grove. In the meantime my step uncle Reg, a fireman, was fighting the fires in our road. He lived in Combe Down. He said he would send a vehicle the next morning, in order to take us to his home. After the all clear we picked our way, avoiding bits of burning wood strewn across the pavements, and saw fire fighters in the gas works. We went to the Westhall Inn which was owned by my stepmother's mother. The door, windows and ceiling were badly damaged. The women and children were squeezed together in a Morrison shelter. During the second raid the bombings were terrific and I didn't see how we could all survive - but we did. The following morning, my house and those of my neighbours were burnt-out roofless shells. We could not live there and the whole family moved in with step uncle Reg in the King William IV in Combe Down until our house was rebuilt after the war. The journey to Combe Down on the morning of the 26th was rough. We sat in the back of an open lorry with the piano tied securely. I cannot remember the route as so many roads were closed. I do remember seeing the Assembly Rooms on the right and the ruins of the Regina Hotel on the left. I was horrified at the damage one night of bombing had done to the city. I was distressed at the loss of my school uniform (very smart, coloured navy blue and gold), my gym clothes, hockey stick and boots and tennis racket, and of course all my books. Also, for as long as I can remember we had a tabby cat called Timmy. When the bombing started he fled from the house. I was more upset about losing Timmy than my belongings. I continued to attend the City of Bath Girls' School. Now living at Combe Down I walked across fields and down a few steps into Entry Hill and so into Oldfield Park. I returned home by bus. My father worked in the Ministry of Labour and every lunch hour he returned to the garden of our home, now only a shell. Timmy, half wild, came and ate food but it was some days before Daddy could catch him and take him to our temporary home. Timmy survived the rest of the war and finally died in 1946. Every Sunday at Evensong we sang "For those in peril on the sea". Little did I know that many years later I would marry a man who, throughout the whole of the war, was one of those in peril on the sea. In September 1944 I was accepted as a Temporary Clerk Grade 3 in The Nautical Almanac Office, Block E, Ensleigh. The office had been evacuated to Bath from the Royal Observatory Greenwich. We supplied information for the Nautical and Air Almanacs. I sat in front of a large globe indicating world wide observatories and predicted the paths of certain stars disappearing and appearing from the moon. The figures were used by more senior members in the office. My knowledge of astronomy was very little but what I learnt was interesting. One of the first purchases I made from my wages was a bike. I earned fifteen shillings a week. My stepmother took ten shillings so it took me a few months of saving. My bike cost two pounds, ten shillings. I became a keen cyclist, hurtling down Prior Park Road and walking up Lansdown Road and vice versa. When it snowed we (the staff at Ensleigh) walked! I was soon made a Temporary Clerk Grade 2. My salary was one pound a week. I paid one shilling in income tax - wasn't I proud! The war ended and the Royal Observatory was moving, due to light pollution, to Herstmonceux Castle in Sussex. I didn't feel I could live in a hostel far from home on a small wage, so left and in 1946 I started out on my nursing career. Our house in Hungerford Road was rebuilt in 1947. I lived there with my grandmother, and it remained my base while I was away nursing. 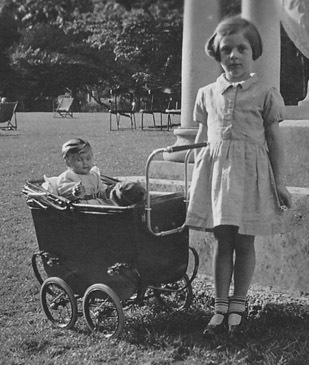 Elsie (pictured sitting in her pram, with me), was a red cheeked celluloid doll. 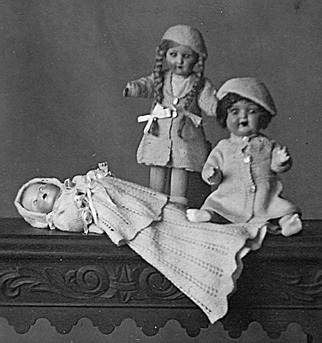 Diana (lying down in the picture on the right), was a baby doll. The other two dolls pictured with her were not mine; one belonged to my sister and the other to a cousin. I also owned Molly, a china doll with jointed knees and elbows, but unfortunately I have no photograph of her. 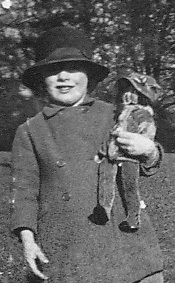 The dolls were all beautifully dressed by my Auntie Win who was a keen knitter. I am grateful that I still have these photos of them. Evelyn thought that the bombs that she saw released from an aeroplane yet did not explode were time bombs. The records show that on 3 December 1940 at around 4:30pm, 10 bombs fell in the Locksbrook Road and Brassmill Lane area along the Midland Railway track, and none of them went off. At the time there was speculation that the plane was flying too low and the bombs reached the ground before the arming process completed. There was also speculation that the string had dud detonators. However, no official reason why none of them went off was ever given. 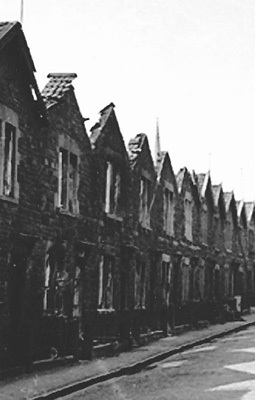 The only way Evelyn could have seen the Assembly Rooms on the right and the ruins of the Regina Hotel on the left was by travelling along Bennett Street from The Circus to Lansdown Road. Evelyn provided all the photographs on this page (except that of the liberty bodice which came from an old product advertisement). The one of the houses on fire says it was taken by Mr Fitch, who was a near neighbour living on the opposite side of the road. The daylight one of the damage after the fires were put out is dated April 1942 but is not signed. The bomb that did the damage was a 250Kg bomb that landed in the gardens behind the houses, which explains why the fires were on one side of the road only. 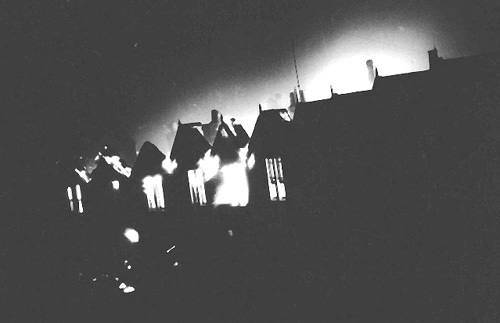 Eight houses were gutted by the fires.